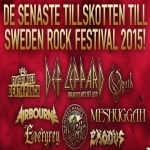 Def Leppard will headline the Sweden Rock Festival in Solvesborg, Sweden for the third time on 4th June 2015 according to the festival website. The band will play here for the third time after shows in 2006 and 2008. Other acts playing here include Motley Crue plus Five Finger Death Punch and Judas Priest who the band play with in Oslo two days before. Curiously the festival poster lists their show as "Greatest Hits Setlist". The actual day line-ups will not be published until closer to the show date. This will be the band's 14th show in Sweden since the first visit in October 1980 with the Scorpions. They last played Sweden for two shows in Helsingborg and Uppsala during the Summer Tour 2013. 9 shows have now been announced for the 2015 world tour in six different countries. This tour follows the 8 European shows played last year in France, Spain, Sweden and Norway. The first show in Solvesborg since June 2008 on the Songs From The Sparkle Lounge tour. Third time headlining this festival. "Def Leppard coming to Sweden Rock for the first time in seven years, and this time will setlistan consist of their most famous songs. And given that the British are one of the world's all time best-selling hard rock band, there's a lot of hits to take off." "Def Leppard returns to Sweden Rock after seven years. Festival Management promises hits on the assembly line. In a press release tells Sweden Rock what the band is expected this summer. Most satisfied are you with the hard rock band Def Leppard. "Given that the British are one of the world's all time best-selling hard rock band, there's a lot of hits to take off," the festival said in a statement."